It’s costume time here at Left Brain Craft Brain! Homemade Halloween costumes have been a big part of my life since I was a little girl. My mom was an artist and loved creating at Halloween. She made me a Raggedy Ann(e) outfit, a dinosaur tail and a regal Cleopatra costume, to name just a few. When The Babe was born, I decided to follow in her footsteps. This year, it’s a Homemade Hoodie Unicorn Costume. It’s perfect for a My Little Pony birthday party coming up, too :) This post contains affiliate links. A few things to know about this kiddo costume. It takes a bit of sewing (either by hand or on the machine), but the benefit is you have a washable costume that lives on long past Halloween. I’m kind of over that whole disposable Halloween thing these days… Also, I’ve made this costume for a size 6 hoodie. Although The Babe is only three and a half, she’s crazy tall so this tutorial should fit your average six-year-old. You can adjust accordingly to fit your needs. First, wash your hoodie, pants and fabric to ensure minimal shrinkage. 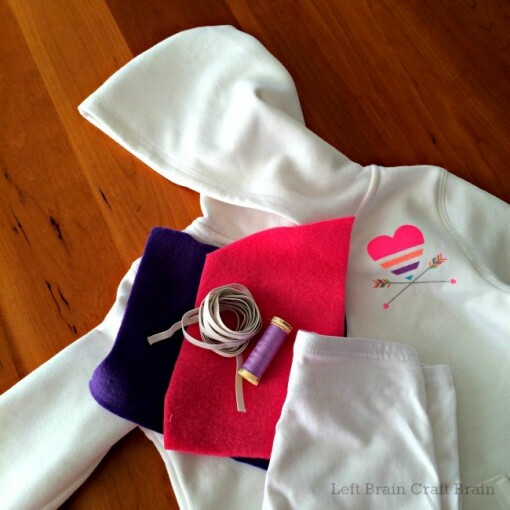 Fold the hood of your sweatshirt in half and use a measuring tape to measure the length from the forehead seam to the base of the neck seam. It’s hard to measure on a curve, but don’t worry, this doesn’t have to be perfect. This will be the length of the fleece you cut in the next step. 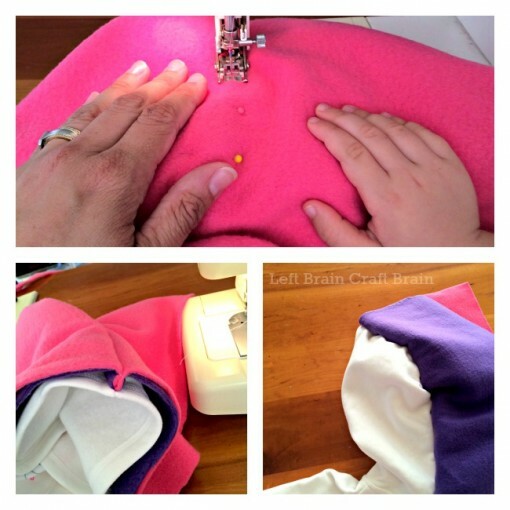 Cut a rectangle out of both pink and purple fleece. Length is the measurement you took in the last step. Width is 20″. Stack the two pieces together, pink fleece on top. Now sew along the pin line of the hood. I used a machine here (this was my first time sewing with The Babe too!) A zigzag stitch will add some stretch to the seam which well help the mane last longer. You can see in the pictures below what it looks like after sewing, both on top and underneath. You’ll quickly notice that none of my sewing is perfect. 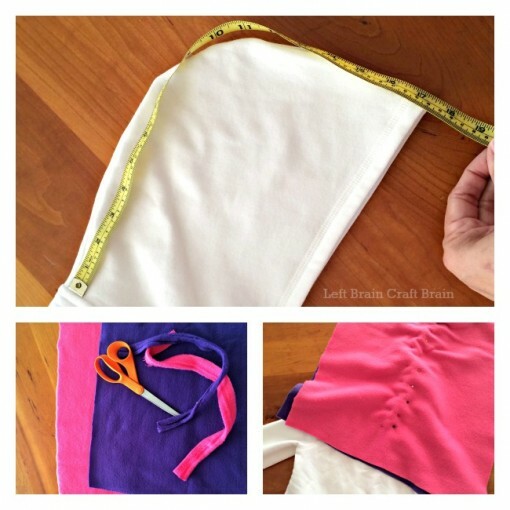 Fleece is highly forgiving, so don’t stress if your seams aren’t perfect. 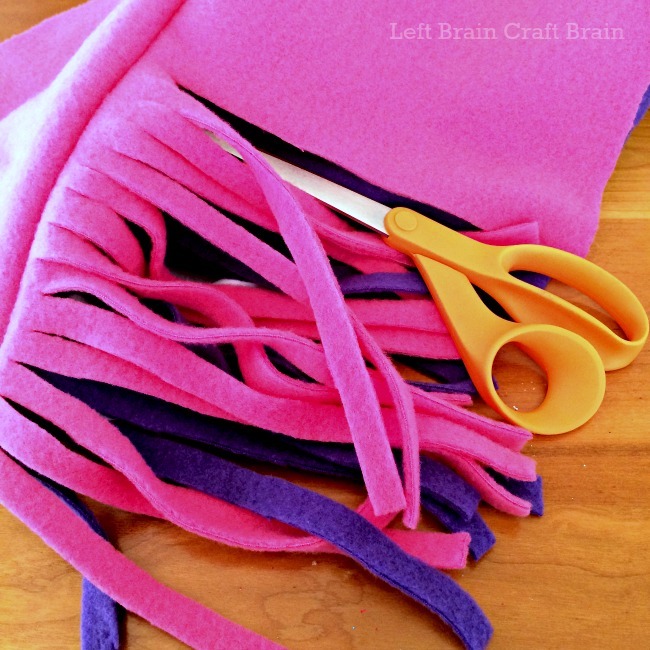 Cut a 4″ x 12″ rectangle of fleece in both colors. Stack the two pieces together and roll them up. You should end up with a jelly roll looking thing about a foot along and one inch wide. Pin one end of the roll to the bottom of the back of the hoodie. Be sure to center it. Now sew the tail onto the hoodie. I did some hand sewing for this step, but a machine will work too. Finally, cut the tail into strips just like you did with the mane. 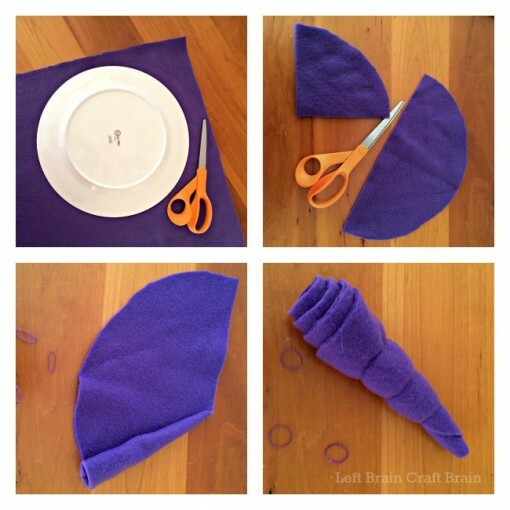 Cut a 4-5″ radius circle out of purple fleece (I used a dinner plate and traced around it.). Trim edges to make sure it is uniform. Roll up the half circle into a cone shape as shown in picture. Take 4 of your small elastic bands and place them over the horn about one inch apart. 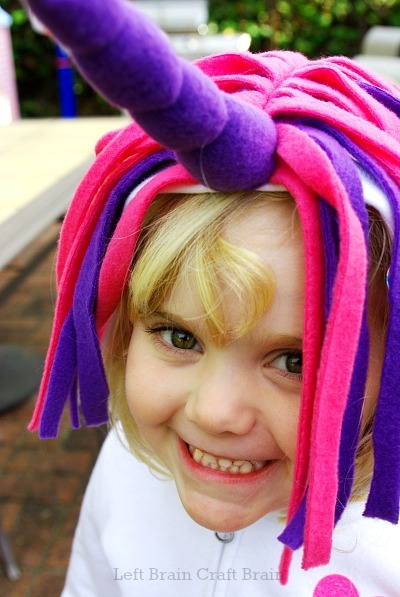 These hold the horn together and give it the characteristic unicorn look. 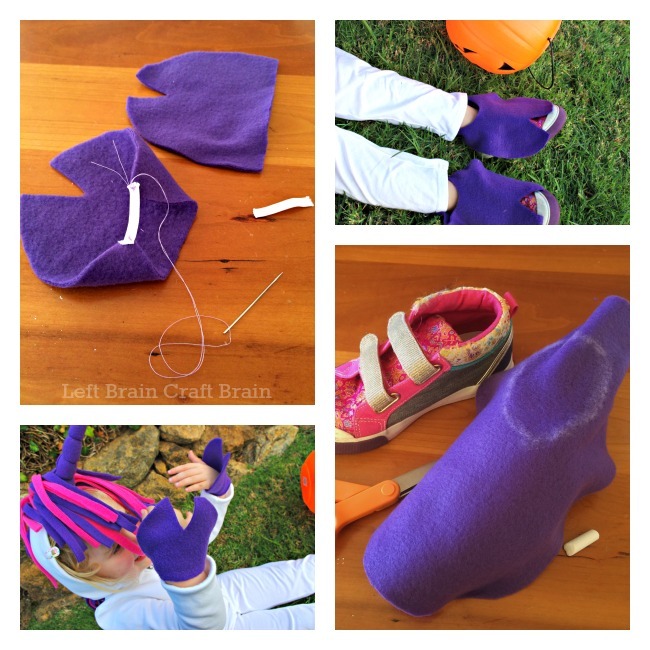 Cut an egg-shaped piece of purple fleece about 3″ long. Cut a bit off the bottom to make it flat. Then cut an egg-shaped piece of pink about 1/4″ smaller all the way around the sides. Stack the two pieces together and cut across the bottom to make a flat edge. 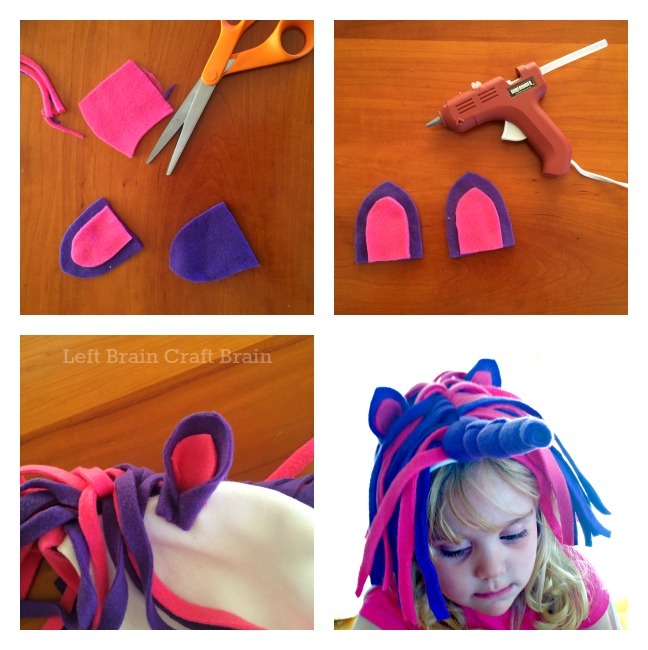 Glue together with a hot glue gun or fabric glue. Fold in the sides of the bottom of the ear. Then pin to the hood approximately 3 inches from the front of hood and three inches from the center mane seam. 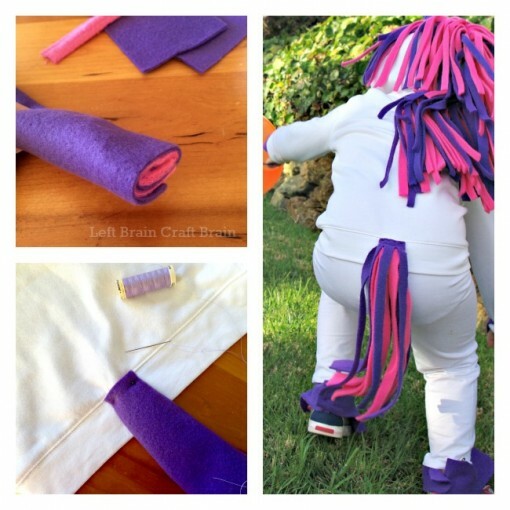 Be sure to move the mane out-of-the-way, you want to sew to the hoodie, not the mane. Then hand sew the ears on. First for the front hooves, you need your child to get the size right. Cut an elongated half circle big enough to cover the child’s wrist and hand completely. Fold in half and cut out a triangle from the curved side. Think long pointy triangle to make it look right. Cut a 1″ piece of 1/4″ wide elastic. Sew each end to the bottom corners of the hooves. For the back hooves, you need your kiddo’s shoes. Drape an oval of fabric over the shoe. Cut the fleece until it is just smaller than the shoe. Make a chalk mark at the opening of the shoe and cut out the hole. Just like on the front hooves, cut a small triangle out of the front of the hoof. Then make a vertical cut at the heel area. You can either use fusible Velcro or a safety pin to close these around your kiddo’s ankles. And there you have it! 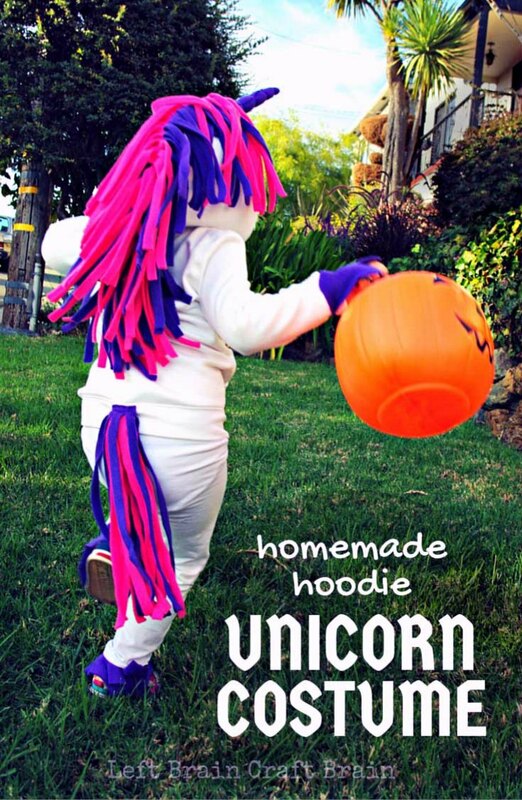 One adorable Homemade Hoodie Unicorn Costume! 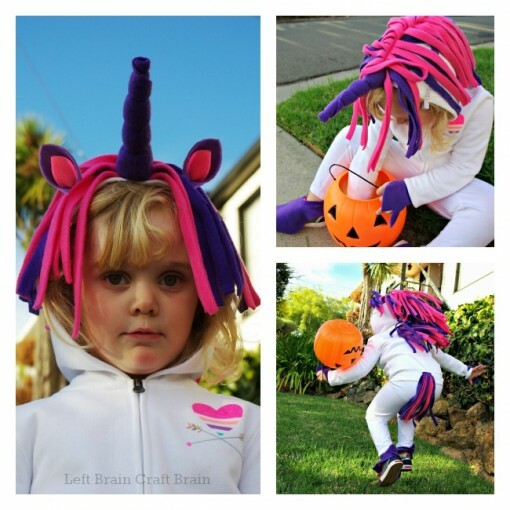 I hope your kiddo has fun jumping and playing and running and playing unicorn like my girl did. 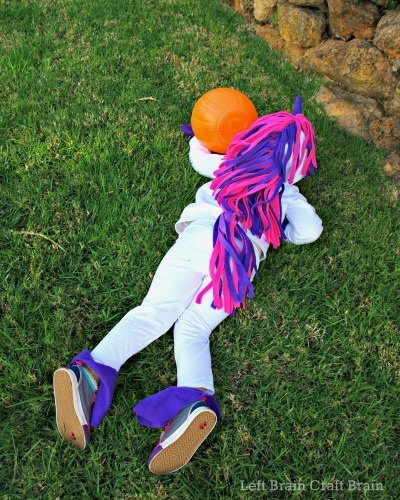 By the end of this photo shoot, she was one tired unicorn!! This turned out awesome! Love it! This looks awesome! I’ll bet this unicorn will get lots of play time! I made this for my daughter without the horn but the hood wont stay up. did you guys have this problem at all? Im thinking I need to add more fabric to the front part of the hood maybe? Hi Kristina. We used some clip barrettes to help it stay on her head. Also, if you find the hood is too heavy (some fleece is heavier than others), you can trim out a few of the pieces in the mane. The other option is to sew a small piece of elastic or some fabric with Velcro that your daughter can wear under her chin. Be sure it’s stretchy or can be pulled off so that it’s not a choking hazard. 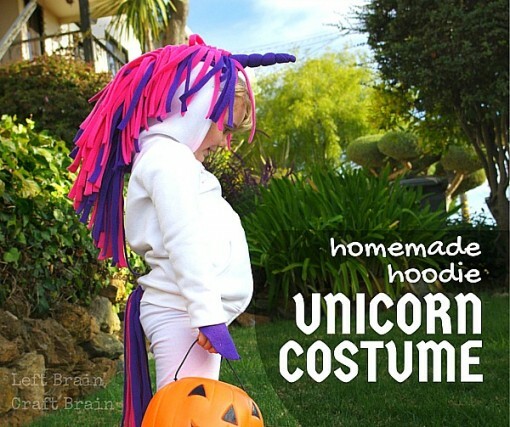 Thanks so much for your tutorial (I found through a Pinterest search)…I know it’s a few years old, but I used it this year to make myself a unicorn Halloween costume! I altered a couple of things, but it really helped to have your instructions on hand. I’m not much of a seamstress (I know the very basics, that’s it) and had to borrow my mom’s sewing machine (and facetime with my sister to thread it lol!). Thanks again and Happy Halloween! So glad it helped your costume making! Happy Halloween.